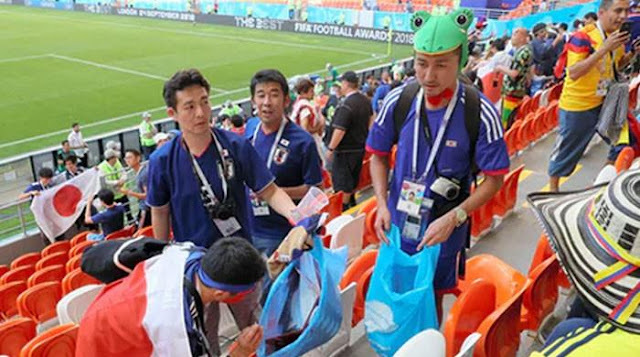 Japanese fans further cemented their reputation as one of the politest sets of supporters at World Cups as they were filmed helping to clean up the Mordovia Arena in Saransk after their side’s 2-1 victory over Colombia. Win, lose or draw, fans of the Samurai Blue clean up after themselves with bin bags they’ve specifically brought into the ground for that purpose. They made headlines around the world with a similar display of tidiness during the 2014 World Cup in Brazil. As well as their cleanliness, Japanese fans also lit up the game against Colombia with a wide array of costumes. The victory lifted spirits at home, after a difficult week for the nation which started on Monday with a 6.1 magnitude earthquake striking Osaka, killing five people and injuring hundreds more. Fans watching Tuesday’s match at pubs and outdoor bars in downtown Tokyo celebrated when Japan clinched their win, flooding into Shibuya’s famous “scramble crossing,” prompting scores of police to come out to ensure order. And at the Russian World Cup, this time the Japanese move seems to have started a trend, as Senegalese fans were later seen tidying up after themselves following their victory over Poland. But it wasn’t just Senegal’s fans who caught the eye on social media. There was huge interest in the Senegal, coach Aliou Cissé. A veteran of the team that shocked France in the opening game of the 2002 World Cup, people were entranced by his dramatic tactical instructions from the game’s sidelines. The world’s tidiest sets of supporters will come face-to-face when Japan and Senegal meet in Ekaterinburg on 24 June, with each side knowing that a win would almost certainly see them through to the next round.